When I was an early 20 something, like any typical early 20 something, I got sucked into a bog of conflicting emotions, torn between life’s vagaries that equaled global warming and poverty in my head. I even got myself traipsing through atheistville for a while when all seemed hopeless. I just couldn’t make sense of life… why things happened or people behaved the way they did. And on one of those very wretched days, I and an equally distraught BFF, like several other times, crafted our way into a beautiful restricted colony park to, let’s just say, reflect on the recent impetuous decisions we had made. We were awfully quiet and while my good friend boarded the Depression Express with a transit at Self-Loath Hub, I eased into carelessly observing my surroundings. Thirty seconds in, my entire being felt an overwhelming connection to everything around me… from a certain hum in the sway of the majestic cook pines to the receding blanket of daylight, from the untroubled laughter of the colony children to the emerging chirp of oblivious crickets, from the smell of the green in the grass to the texture of the tree trunk my hands hadn’t touched yet. My senses had blended and infused into everything and I felt such love, it was so very profound and impersonal. Everyone experiences this kind of overpowering, almost perplexing, emotional wave at some point in their lives, it could be triggered by the simplest of things like when you’re listening to a song or watching sunset over the horizon or bonding with family. It’s spontaneous, hits you right in the feels and takes over like a tide. You remember it years after because of the way it made you feel and the deep connection it invoked. It is, in essence, absolute love, ubiquitous, streaming right from the source; woven into the fabric of the universe, essentially making it also the core of our own being. The reason we can’t feel it all the time and only see glimpses of it is because we filter it through the prism of ego, making it appear limited and like it exists outside of us. It seems as though, to feel love, one must have someone or something to feel it for or inspire from or that we can only love a few people and that there are different kinds of love. There’s really only one grand unifying love. Today when I think back to that moment in the park, I realize more than ever, love is very different from what you and I have been programmed to understand. Each and every one of us is capable of boundless love but unfortunately we have crippled ourselves with all sorts of beliefs, systems, prejudices and ideologies. Human love that we experience today is fickle, subject to conditions and is enslaved most often to an object outside of us that provides fleeting moments of mock fulfillment. If we really think about it, every relationship we hold is structured around our needs- physical, psychological, financial, emotional and social. No matter who or what we love, at some point, the object of our affection disappears or becomes less lovable and ours needs are not met anymore which is why this kind of love seldom exists without pain. What I mean is, love we know is conditional and anything with conditions is a transaction. There’s nothing wrong with making transactions, some of us have made excellent arrangements, it’s CONVENIENT but is it FULFILLING, does it raise you, is a whole different question. I don’t mean that every relationship we’re in, is devoid of love, we do experience love but it’s terribly scarce. The gap between what love can be and what we allow it to be is a challenge that we are just not aware of. Now you may wonder, if I am happy with the convenience, comfort and wellbeing that I get out of a relationship, why would I chose any different? We’re missing the whole point now, aren’t we? The driving force of our relations today is selfish-ness (not love) not selfless-ness (love). There’s a reason they say, you “FALL” in love. Because essentially you are willing to destroy a bit of you for the sake of someone else because that person has become more important to you than yourself. Selfless love, selfless service, selfless intentions are the juice of spiritual life. That’s the way forward and that’s the only way we are going to evolve. We must extend the practice of love to all no matter how much our feelings and thoughts restrain us. Instead of why should I, ask yourself why not? Why shouldn’t you treat everyone with kindness? Why should your reactions always depend on how others treat you? What if you consciously chose to conduct yourself with love and kindness even when its hard? It’s not so much as feeling love all the time for everyone that’s important, it’s about how can you put your very best forward in any situation towards anyone despite the constant battle of thoughts and emotions going on within you. You do have the ability to do it and I can say so because we are wired that way at our very core. We attach ourselves to articles left by people who are not with us anymore, we find the swings outside our childhood home endearing. The article or the swing does not provide us anything by itself, it is how choose to connect with it. The purpose of life, and believe me you’ve had many, is not to get through them and be done with it but to evolve as spirits and raise your consciousness. You cannot achieve that kind of development, if you’re constantly drowning in negativity either by your own making or people around you. Rid yourself of all the negative emotions and, as nauseatingly cheesy I’m about to sound, fill yourself with love. You need not be in love with any person in particular, your love shouldn’t be dependent on someone, love is an inner state, be in love with LIFE. When you view everything and everyone around you with nothing but love, the world just becomes beautiful. You realize love is not something you DO, it’s what you already ARE. Nice to see you blogging after a long time ,nice one . ”The driving force of our relations today is selfish-ness (not love) not selfless-ness (love).” Insightful indeed! There will be so much written about love, but only one who has introspected much can come up with this clarity. Thank you for sharing this. Lovely to read your work after long. I agree. Maybe the mind is just not conscious of the simple nature of love, but acquires the narrative from everywhere which just obscures the reality of love. Often, we are trying to measure a feeling with expectations and yes, as you mentioned, ‘dissected’ and made vulnerable with frivolous ideas. We have attributed too many connotations to love, and it becomes difficult for us to experience the way of life that it should be, in all its simplicity and also a continuous communication that can pave the course for feelings to flow to a confluence. Instead, it has become competitive, comparative, and superficial display that is ruining the true spirit of love. Indeed, as you say, priorities of human beings have changed and seen a shift from a spiritual existence to a more existential one. The ecosystem of life is entrapped in a never-ending desire to acquire and destroy. There is still hope for love to survive when the heart and mind communicate and realise the importance to move away from such distractions. In fact, in silence one can realise the true calling. Thank you, appreciate your time! 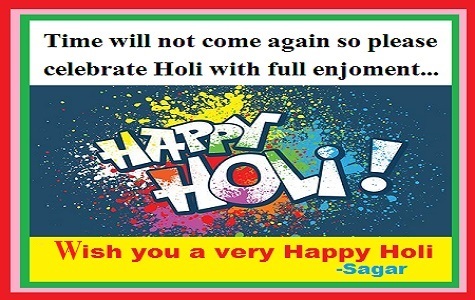 Happy Holi to you too! I THINK YOU DROPPED SOMETHING… WHAT?… YOUR DOPPELGANGER!